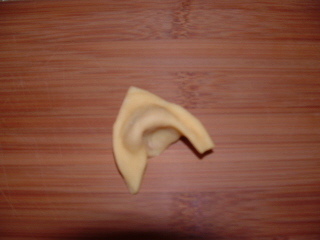 Tortellini hails from the city of Bologna, Italy. 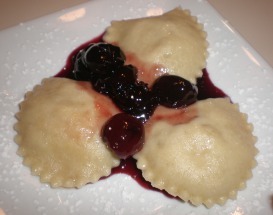 This delicate, fresh pasta, shaped and filled with flavorful ingredients such as cheese, meat, fish, or vegetables, is one of the essentials of Italian cuisine, found in nearly every region of the country in countless varieties. 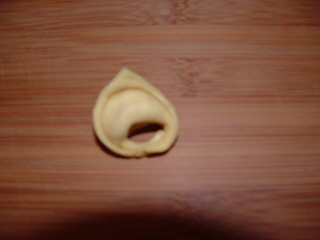 Traditionally, tortellini are cooked in a simple chicken broth to make the classic dish Tortellini in Brodo or are paired with a light tomato sauce. 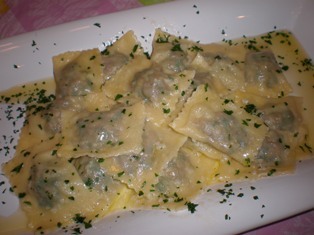 The larger tortelloni can take on heartier, more substantial sauces, including butter, cream, or vegetable-based sauces. brodo (broth) and the tortellini filling the day before you plan to serve it. The next day you can make the dough and fill the tortellini before simmering them in the skimmed brodo. It is more work than your average recipe but it is certainly worth it. We serve Tortellini in Brodo as a main course during the cool weather months. 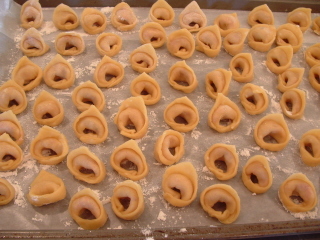 This recipe produces a lot of tortellini. If you are going to make the effort of making tortellini from scratch, go ahead and make the whole batch. 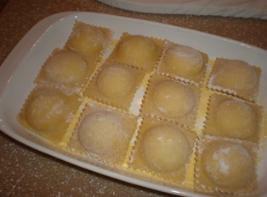 Freeze the extra tortellini and take out as many as you need for other meals. 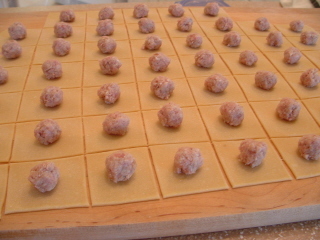 To freeze fresh pasta with a meat filling (such as this one), line a large baking sheet with aluminum foil and spread out the pasta on the sheet so that the pieces do not touch. Freeze several hours or overnight then gently drop the pieces into heavy freezer bags. Freeze up to 3 months. Put all ingredients, except salt, in stockpot. Cover with 3-1/2 quarts of cold water. Bring to a boil over high heat. Skim foam and fat that rises to the surface. Add salt, cover, and simmer for 2-1/2 hours. Skim occasionally. Taste and adjust salt. Pour through a fine mesh strainer into a large container. Cool to room temperature, cover and refrigerate overnight. The next day, skim off any excess fat that has accumulated on the surface. In a small skillet, sauté veal in olive oil until cooked through. Set aside to cool. Cut into pieces. Add veal, prosciutto, and mortadella to food processor. Process until finely chopped but not pureed. Add Parmesan, egg, and nutmeg. Roll out the pasta dough with rolling pin. Cut into 1-1/2 inch squares. 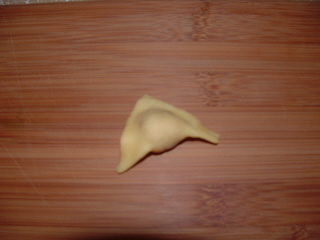 The tortellini can remain at room temperature for up to an hour before cooking them in the broth. Otherwise, cover and refrigerate them until serving time. Bring the brodo to a boil in a large saucepan. Add the required number of tortellini and simmer about 8 minutes or until they rise to the surface. Each diner should get between 12 and 18 tortellini depending upon how big you made them.